Each of those words are synonyms for big and bold – combine all four and you’ve got one of the largest, most powerful and robust street-going sport utility vehicles in the world. John Hennessey is a Texas-based tuner known for creating some of the fastest and most capable cars on the planet. Over the past two decades, machines like the Viper Venom 550, Ford GT 1000 Twin Turbo, HPE 700 LS9 Camaro and the almighty Venom GT have emerged from the Hennessey Performance garage. And those are just the celebrated flagships; the company has modified thousands of other street cars including those from Audi, Bentley, Cadillac, Ferrari, Ford, Porsche and Toyota, to name a few. Now, after tuning countless Ford F-150 SVT Raptor pickups and fielding multiple requests, the company has created something unique to fill a void in the performance-oriented sport utility segment. It is called the Hennessey VelociRaptor SUV, and Autoblog was recently handed the keys to the very first example to hit the pavement. Each VelociRaptor SUV begins its life at a Ford assembly plant when it rolls out the sliding doors as a completed F-150 SVT Raptor SuperCrew pickup. After traveling through dealer channels, it is delivered to Hennessey Performance for the transformation. Hennessey told us the objective was to make it appear factory stock. The team first cuts away the top of the pickup’s bed, and the trailing part of the Supercrew’s cab, to enable new parts to be welded in place aft of the second doors. The new sheetmetal is seamlessly crafted into the silhouette of an SUV. After masking and painting, new original equipment tinted glass side windows from the discontinued Ford Excursion (the company last made the big truck in 2005) are purchased and installed over each rear wheel. Then a brand-new composite three-door tailgate, also from the Excursion, is surgically fitted to replace the Raptor’s pickup tailgate (the rear tail lights and bumper from the Raptor are left untouched). The newly enclosed bed is padded and carpeted, and modified Excursion interior panels line its covered sidewalls. Lastly, a dark headliner covers a thick layer of insulation in the roof. Hennessey told us the objective was to make it appear factory stock. Even after our own close scrutiny, it appears he’s come darn close. Customers are offered a choice of what they want to do with the rear space. Opening the rear doors of the SUV reveals a cavernous interior, much larger than anything else currently on the sport utility market. Customers are offered a choice of what they want to do with the rear space. Some may prefer to keep it open, as the person did who ordered our white tester, while others may choose to put a second row of seating back there and still retain plenty of space behind the third row for cargo. Hennessey mentioned that one client asked for four captain’s chairs, while another requested to eliminate the second row completely and just offer opulent first class seating for two very fortunate occupants in the back. Additional entertainment options (e.g., flat screens and audio), upgraded brakes and even armored packages are available, too. Hennessey offers its VelociRaptor SUV with the stock engine, or with an upgraded supercharged powerplant, thus earning the name VelociRaptor 600. The stock unit is Ford’s 6.2-liter V8 rated at 411 horsepower and 434 pound-feet of torque. Even with the naturally aspirated engine, the SUV is hardly a slouch as the 6,600-pound SUV will hurry to 60 mph in about 7.5 seconds (about half a second slower than the stock pickup). But those wearing the biggest belt buckles will definitely want the blower upgrade that adds a TVS2300 supercharger system, air-to-water intercooler, upgraded fuel injectors and a high-flow air intake. The result is 600 horsepower, and a 0-60 time of just 5.9 seconds. While our test car didn’t have them fitted, Hennessey also offers a stainless steel cat-back exhaust with high flow catalytic converters for even more power. At first, it appears that Hennessey Performance has completely rebuilt the truck. Yet what has not changed from a stock Raptor is almost as significant as what has. Nothing in front of the rear doors is touched, meaning the first and second row seats, dashboard, instrument cluster and all of the stock gauges and infotainment remain intact. The thick steering wheel, with the red leather centering band, is still there too. There are only two exceptions. First are the embroidered “Hennessey” head restraints. Second is the small aluminum plaque, adhered to a horizontal space on the center console just in front of the shift lever, with the company’s name and the chassis number. It’s brutally powerful with a punch that contradicts its three-plus-ton curb weight. So how does it drive? Would you believe better than the stock Raptor? From the driver’s seat looking forward, there is nothing to distinguish the SUV from its pickup donor. Yet glance out the side mirrors, or check the internal rearview mirror, and its new mass looks intimidating. But again, the illusion of size is misleading. The width of the SUV, its turning radius and its maneuverability in traffic are identical to the pickup – even though that’s tough to swallow. Step on the throttle and the supercharger’s whine spills into the cabin through the firewall. There is only the slightest bit of hesitation before the big SUV starts clawing at its rear tires to launch the behemoth forward. I’d never describe the Hennessey SUV as quick; that insinuates something that is light and agile. Instead, I’d call it brutally powerful with a punch that contradicts its three-plus-ton curb weight. There is no urge to zip in and out of traffic. It is a broad-shouldered beast that effortlessly gets itself up to speed regardless of the required velocity. I crossed urban Orange County and was the first away from each light. I merged onto the highway and had to hit my brakes at the end of the on-ramp as I was carrying too much speed. Yeah, 600 horsepower will do that to you. The ride was better than stock. The ride was better than stock, as the additional 500 pounds of weight sits directly over the driven wheels as if the bed is now carrying a light load. This not only seemed to decrease any bouncing, but it likely balances the chassis, too (stock weight distribution is 56 percent front, 44 percent rear). The SUV still drives heavy, but its highway ride is exemplary. Handling remains competent, only limited by the grip of the tires and the weight that is forced to shift with each transition. Few will feel the urge to autocross a VelociRaptor SUV. Acoustically, things have changed too. Instead of having sound reflect off the flat glass wall inches behind the second row of seats, the large enclosed SUV absorbed much of the road noise. It was notably quieter than stock (I should mention that Hennessey puts plenty of Dynamat in the walls and sprays additional sound deadening in the wheel wells during the conversion) and without much of the annoying tire drone. So, why isn’t Ford making them? The Hennessey VelociRaptor 600 SUV is an impressive package – and that’s positive praise. So, why isn’t Ford making them? In a nutshell, our friends in Texas have carved out a niche that is too small to be served by the Detroit giant. Unless thousands of units can be sold, meaning a viable business case has to be made, no executive at Ford will ever allow a low volume, thirsty and expensive truck to wiggle its way through the tangled bureaucracy. Even if it did, development, testing, emission certification and production would be cost prohibitive in today’s marketplace. So, as of now, John Hennessey owns the segment. Hennessey has plans to make about 30 of the VelociRaptor SUVs each year, and there is no reason why he won’t sell out even with a jaw-dropping base price of $159,500. The range-topping VelociRaptor 600 that I tested, rocking a supercharged V8 that renders it nearly invincible, brings the price to about $175,000. 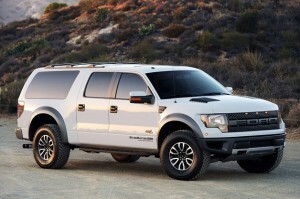 The capability of Raptor, the utility of Excursion, the boast of Texas and the power of Hennessey – in one big package.